Perched between the mountains and the Mediterranean in the medieval village of Eze, the chateau de la Chevre d�Or has an unbelievable view. 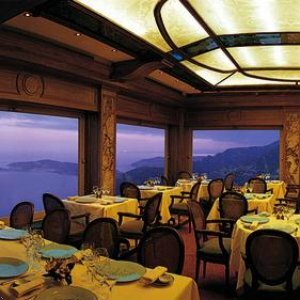 True to its culture and region, the restaurant offers one of the best Proven�al/Mediterranean experiences around �even amidst Monaco�s annals. Although the Chateau is now a fully fledged hotel not just a restaurant its single greatest attribute remains the restaurant and the lip smacking cuisine it turns out. The Head Chef, Philippe Labb�, offers a mainly classic French repertoire, a subtle blend of tradition and modernity, with Mediterranean nuances in the broader regional sense. The ingredients are rigorously selected from local producers with a new menu to match each season. Philippe Magne, the Head Sommelier has developed a wine list reflecting all of the French wine-producing regions from a cellar boasting 20,000 bottles. Starred table cloths and crockery, specially designed as the Ch�vre d'Or's emblem, enhance the overall atmosphere and reflect the faultless service. The marble floors lend an aristocratic elegance to the ambiance while the cherry wood panelling radiates golden warmth and comfort.